Bay area thrash metal legends Exodus has returned after four years absence in the studio and bringing with them is their most recent album titled "Blood In Blood Out" and once again with Steve "Zetro" Souza on vocals and definitely this fact takes them back to their roots, talking about this thrashers I could compare them to the fastest and vertiginous ride over the roller coaster up and downs, sudden turns, slow moments to the pinnacle and downs to freeze; undoubtedly, always has been like that, in my most honest opinion their newest album is aiming those fans who likes more "Fabulous Disaster" and "Tempo of the Damned" era and I am among those fans, so what are you about to read it might be a little influenced by the thrasher I carry inside me. 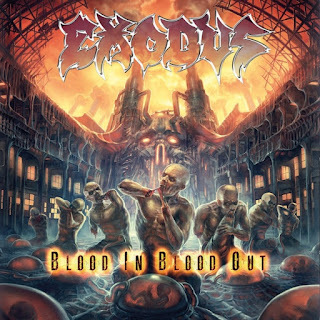 After ninety seconds of electro-weird intro of "Black 13" Exodus unleashes their vicious thrashing sound with Zetro vocal assault, alongside the sharp and fast guitar riff Gary Holt and Lee Altus proves their highly skills at thrashing, while Tom Hunting batters his drum set without remorse, then follows "Blood In Blood Out" from beginning is a thrashing storm fully loaded of aggression, simply Zetro doesn't sound old, he stamp his signature energetic vocals while the guitars linger on trashy riff from the eighties, Gary Holt solo is eloquent, you can't expect less from him, "Salt in the Wound" features Kirk Hammett, oh yes! as you can see, Exodus went true deep to their roots not only for the song writing, having Kirk Hammett trading riff with Gary Holt sounds amazing, at this point I can tell you this track is one of the best of the album because the way Jack Gibson plays his bass with so much personality and Tom Hunting literally destroys his drums up to the guitar solo brightly executed by Kirk Hammett all wrapped with the screaming vocals of Zetro, what else you can ask for? 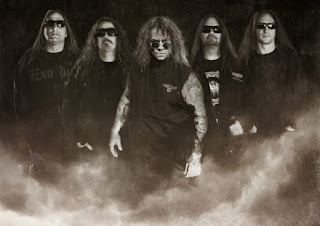 Another outstanding track is "BTK" featuring the great Chuck Billy from Testament who does some of the choruses alongside Zetro the track is built in grooves shifting a little bit from the previous tracks, but it worth to highlight it, "Wrapped in the Arms of Rage" rapidly goes back to business with sharp and fast riff, guitar duels and mesmerizing solos, "My Last Nerve" falls into a mid pace that affect the usual dynamic but put them in solid ground, "Numb" it is a more raw piece of Thrash metal allowing Zetro to display his rabid youthful vocals, "Honor Killings" as soon as I heard this track I did a quick connection to Slayer "South of Heaven" era, you might figure out later on, the last track "Food for the Worms" delivers an inhuman drum work, with vicious mid pace riff and a intense and fierce bass that pumps the fuel to the cauldron, what amazing way to close a superb album. If there is something I really enjoy is when a band has the capability to blend everything without losing their essence, giving the proper space for each instrument, this album is not only a return to their dominion, but it leads them to conclude a cycle that never ended back in the mid-nineties, absolutely a true masterpiece.